A "Simulated 2.6GHz" AMD quad-core would beat the best Intel Xeon by 42%, or so we were told back in March at CeBIT. AMD's latest is a device with 463 million transistors designed to run at a clock speed of at least 2.2GHz, possibly 2.8GHz. Scheduled for launch in the middle of 2007, Intel's best Xeons would be once again in the rearview mirror of their AMD competitors. AMD's third generation Opteron sure looked very promising back in early spring 2007. June, July, and August went by, but still no Barcelona, and when the news started to trickle in that AMD's newest quad-core would only reach 2GHz, AMD's future didn't look so bright anymore. It became even worse as the launch date and details of the newest 45nm Xeons popped up on a public webpage for resellers: November the 11th. New Xeons at clock speed up to 3.16GHz are thus only a few months away. "Not so bright" turned into "grim" - even "dark, really dark". Before we start, here are a few important notes on our testing. We were only given a few days with the newest quad-core before the NDA was finished. As a result our server benchmarking is only a preview, and we'll follow up with more details in the near future. Also, instead of repeating all of AMD's improvements to the core again, we'll simply refer to our previous article about Barcelona's architecture. We'll discuss these architectural improvements further together with the relevant benchmarks. Finally, for those that are wondering what happens if you pick up a quad-core Opteron server and try to use it as a desktop (or just a hardware editor looking to predict Phenom performance as best as we're able), Anand has put together an AMD Phenom Preview where he does exactly that. Getting the GeForce 8800 GTX into a server chassis took some work, and the focus is on K8 versus Barcelona performance scaling, but the results might give a decent indication of where Phenom X4 will land in a couple months. according to mysql site, starting with 5.0.37, the mutex contention bug and the Innodb bug has been improved by a lot, which helps 8 core systems. I was wondering that since 5.0.45 is available on mysql's website, why isn't the latest mysql being benchmarked? 5.0.26 still has that bug, and you can see it in the benchmark where a 8 core system is slower than a 4 core which is slower than a 2 core. I currently have a 4 way 2.4ghz opteron as a production db server that I am considering upgrading. I'm trying to use the Anandtech benchmarks to help project how much performance gain we'll see in a new machine. We're running Oracle but are considering moving to MySQL. So I am trying to compare the stat's in 2 Anandtech reviews to see how the new Barcelona cores compare to the Intel Woodcrest and Clovertown. In looking at this article from June 2006( http://www.anandtech.com/IT/showdoc.aspx?i=2772&am...">http://www.anandtech.com/IT/showdoc.aspx?i=2772&am... ) , 2x3ghz Woodcrests (4 cores, right?) run the MySQL test at about 950 QPS (queries per second) for 25,50 and 100 concurrent sessions. However this recent article in September 2007 ( http://www.anandtech.com/IT/showdoc.aspx?i=3091&am...">http://www.anandtech.com/IT/showdoc.aspx?i=3091&am... ) appears to show the same 2x3ghz Woodcrests running 700,750 and 850 QPS for 25,50 and 100 connections respectively. That represents a 20% or so DECREASE in performance of the same chip in the last 12 months. Ultimately I want to compare the Opteron 2350 vs Xeon 5345 and then the Opteron 8350 vs Xeon E7330 but I'm starting with what exists for benchmarks first so I can make sure I understand what I am reading. Can someone please help set me straight. The article in june 2006 uses 5.0.21, and there might also be a small change in tuning. The article in September 2007 uses the standaard 5.0.26 mysql version that you get with SLES 10 SP1. The newest version 5.0.45 will give you performance like the above article: MySQL has incorporated the Patches we talked about (that Peter Z. wrote) in this new version. I read another review and they got these scores on the slightly lowerspeed 1.9 GHz Barcelona. It seems your Barcelona scores are way off for some reason. The Xeons score is more or less identical. This seems really weird. Normally the higher score is the correct one due to some bad optimizations. The rest of the article is great though. This article seems to be very biased. 1) they choose faster Intel processors, 2 GHz Opteron. There are 2 GHz processors available across all the processors used in this analysis. 2) No mention of what compiler was used. Intel compilers earlier had a trick, which was not documented - any code optimized for Intel processors if used on non-intel processors (uhm! AMD), would disable all optimizations. Who knows what else they are doing now. And this gentleman used Intel optimized code on AMD to test performance. Who in the right mind measuring performance would do that? 3) Intel MKL was used for BLAS. Shouldnt they use ACML for AMD code? Again, who would do that when looking for performance? 4) Memory Subsystem - knowing that the frequencies are different, why were all the results not normalized? 5) They managed to comment that Tulsa and Opteron 2000 series are half the performance of core or Barcelona and hence should not be considered in the first page. 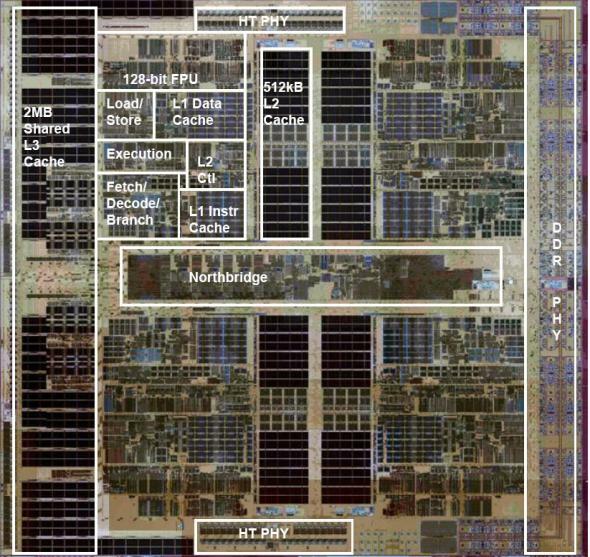 But in Linpack page, it is mentioned that Intel chips ate AMD ones for breakfast. Of course, they did - peak of Xeon 5100 series is twice that of Opteron 2000 series. You dont need LINPACK to tell you that. Gives a very biased impression. 6) LinPACK results graph could not be any more wrong. The peak performance of each CPU considered is different ... obviously their sustained performance is going to be different. The author should have at least made the effort to normalize the graph to show the real comparison. 7) Since when is Linpack "Intel friendly"
The author says they didnt have time to optimize code for AMD Opteron ... why would you do a performance study in the first place if you didnt have the methodology right. I didnt even read beyind LinPACK .. I would be careful reading articles from this author next time and maybe the whole site ... Its sad to see such an immature article. Whats worse is majority of people would just see the "fact" Intel is still faster than AMD. why would you do a performance study in the first place if you didnt have the methodology right. Memory Subsystem - knowing that the frequencies are different, why were all the results not normalized? What about the bytes/Cycle in each table? The author should have at least made the effort to normalize the graph to show the real comparison. Why is that the "real comparison"? If Intel has a clockspeed advantage, nobody is going to downclock their CPUs to be fair to AMD.
) Since when is Linpack "Intel friendly"
First you claim we are biased. As we disclose that the binary that we run was compiled with Intel compilers targetting Core architecture, it is clear that the binary is somewhat Intel friendly. It not wrong. It is incomplete and we admit that more than once. But considering AMD gaves us a few days before the NDA was over, it was impossible to cover all angles. same frequency cpu is very interesting too. Your LINPACK score just seems obscure. Somewhat Intel friendly compiler? LOL. If the compiler is so great why is the gcc score I read on another review 30% higher with the Barcelona(with a 1.9 GHz CPU)? That is just ridiculous. I thought this review was about architechture and what it can perform and not about which compiler we use and if it is true that optimizations is turned off in then Intel compiler if it is an AMD cpu then the score is worthless and the comparison is severly biased. Which review? Did they fully disclose the compiler settings?